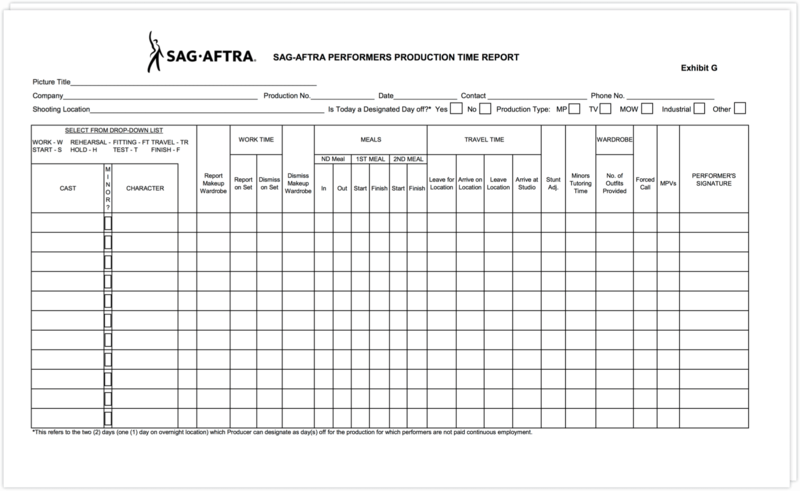 So someone forwarded you a production time report (aka the “SAG Exhibit G”) to fill out for your production, and you have no idea where to start? Fear not! You have come to the right place. This quick and easy guide will walk you through everything you need to know. 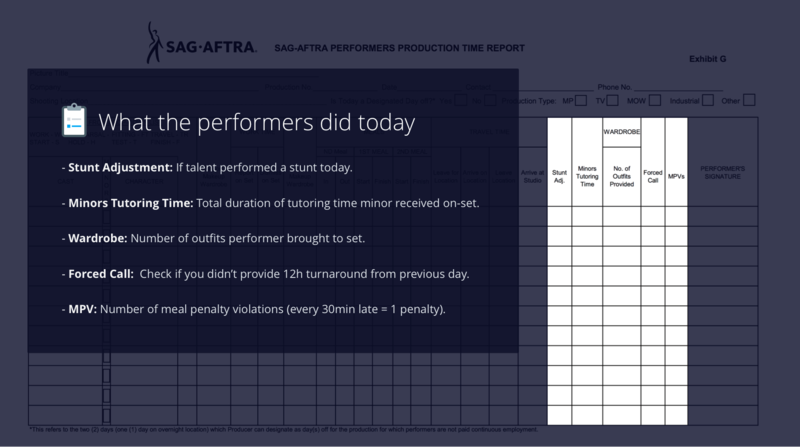 The SAG-AFTRA Performers Production Time Report, commonly referred to as the Exhibit G, is simply a record of each performer’s time on set. Although it appears complicated, the SAG Exhibit G form is actually pretty straightforward. 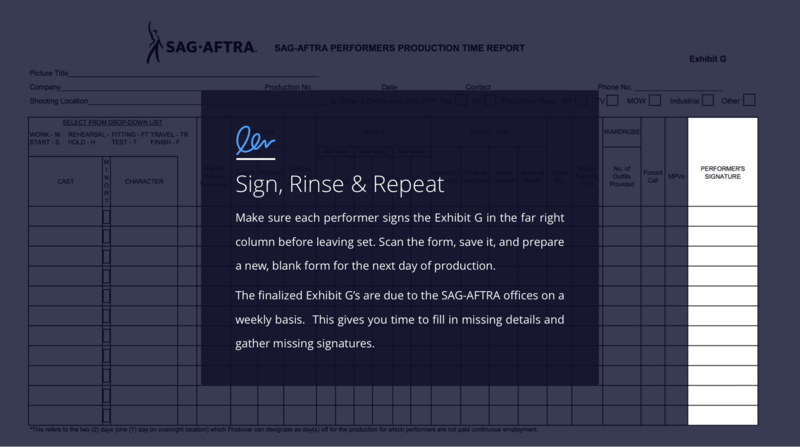 Before we walk you through it, download the latest version of the SAG-AFTRA Exhibit G Form. How to fill out the SAG Exhibit G? The Header - The top of the Exhibit G form, where general production information goes (title and contact information for example). The List - This is the who part of the form. It lists the names of performers and what they are doing on set that day. The Timesheet - This is the heart of the form. Here is where you record the times actors arrive, leave, eat, etc. for each production day. This is the top of the SAG Exhibit G form. It contains details regarding your project. Some of the data in this section won’t change throughout the production. If you fill out this section in advance, you’ll save yourself a few moments every day. I’ve added stars (⭐) to the sections you can fill out in advance on the Exhibit G SAG form and re-use from one day to the next. The title of the production. Use the exact same title you used on your SAG-AFTRA paperwork. This is the production number that SAG-AFTRA assigned to your production when they approved your initial paperwork. SAG usually sends this number in an email along with your production paperwork packet. Today’s shoot date. You’ll fill out a new Exhibit G SAG form for each day of production. The name of the person who is the primary intermediary with SAG-AFTRA. Typically, this is a production manager or line producer. The primary contact person’s phone number. The address of the location or locations where you’ll be shooting today. IS TODAY A DESIGNATED DAY OFF? Production must take between one and two days off per seven days of shooting. Only check yes if you are shooting on one of those days off. Select if this project is a motion picture (MP), television (TV), Movie of the Week (MOW), Industrial, or Other. And that’s it for the header! Now, to the list! This is where you provide information on the Exhibit G SAG form about who’s working, and about what type of work they’re doing today. We’ll look at the first four columns on the left side of the chart, and at four columns on the right side. These SAG Exhibit G samples provide different scenarios to work from. List the name of each actor who works today. Use the same name the actor uses with his or her union membership. Most union contracts expect you to list non-union actors here as well - but check with your SAG rep! Check this box if the actor is a minor. The name of the character that actor is playing (i.e. ‘Darth Vader’). If the performer is a stunt performer or specialty performer, list their job title. S = Start. The actor’s first paid day. R = Rehearsal. A rehearsal day. FT = Fitting. A wardrobe fitting. T = Test. A test day for camera or makeup tests, for example. The actor may be on set, but isn’t acting yet. W = Work. A typical production day. TR =Travel. A travel day. H = Hold. A hold day, when the actor isn’t working, but has also been asked not to take other work, just in case. 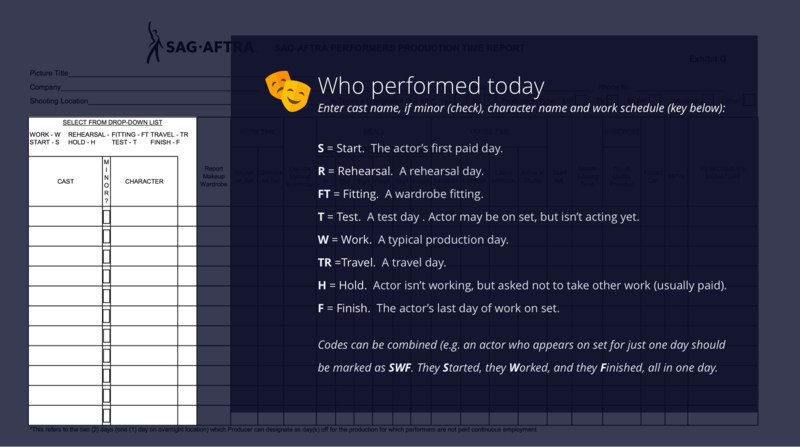 Actors typically get paid for hold days. Ask your SAG rep for the contract rules for hold days on your project. You will often use these codes in combination. An actor who appears on set for just one day will have SWF listed in this column. Not because they are a Single White Female, but because they Started, they Worked, and they Finished, all in one day. Don’t worry! If you don’t memorize the codes, there is a key on the Exhibit G form. There are five specialty columns on the right side of the chart, just before the signature column. They provide SAG with additional information and can trigger potential bonus payments. Check this box if the actor performed a stunt today. This is an additional dollar amount given to a performer for doing work outside of their contract. This typically happens when adding an additional stunt on set or adding complexity to an existing stunt. If you are working with minors, they may be required to spend some of their day “in school,” working with a tutor (aka “Studio Teacher”). Record the total duration of tutoring time that each minor received here. If actors brought outfits to set at the request of production, write the number of outfits in this box. Performers receive a pay bump for this. 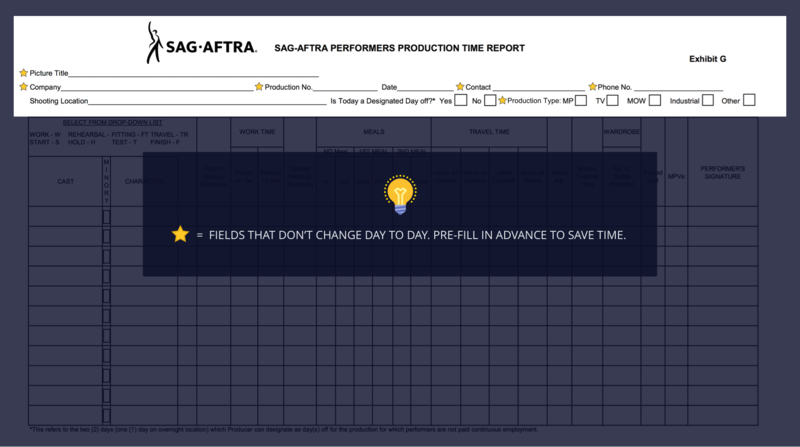 SAG-AFTRA requires twelve hours of down-time between when an actor leaves set and when they come back to set the next day. If you don’t have twelve hours of “turn-around,” it is considered a forced call, and you need to check this box. A meal penalty is applied for each half-hour a meal break is late (so, a meal two hours late is charged four meal penalties). If there are meal penalties for this actor, the number of penalties is noted here. Finally, we’ve arrived at the heart of the SAG Exhibit G.
Work time marks the time the actor arrives and departs set. 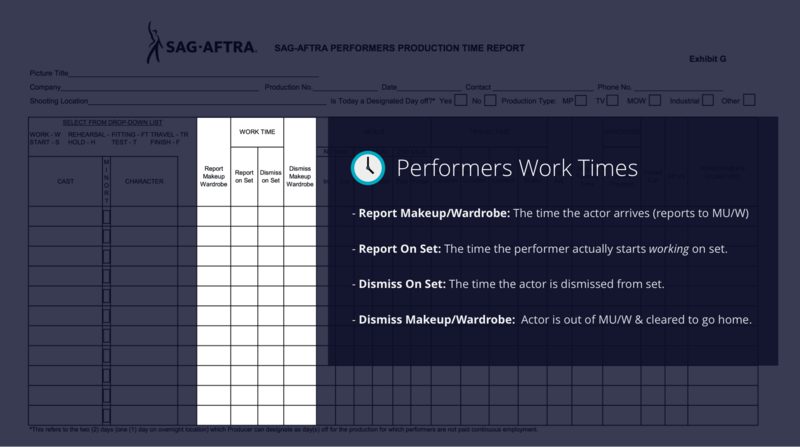 Travel time to and from set is generally not considered work time, unless the set/location is very far from the actor’s home, or from one of the guild’s designated “studio zones” (check with your SAG-AFTRA rep for specifics). When filling out times on the SAG Exhibit G, be sure to also write AM or PM. The time the actor first arrives to work. Usually, the first thing the actor does when arriving is report to either makeup or wardrobe. But not always. You want their arrival time here. The time when the actor starts working on set. 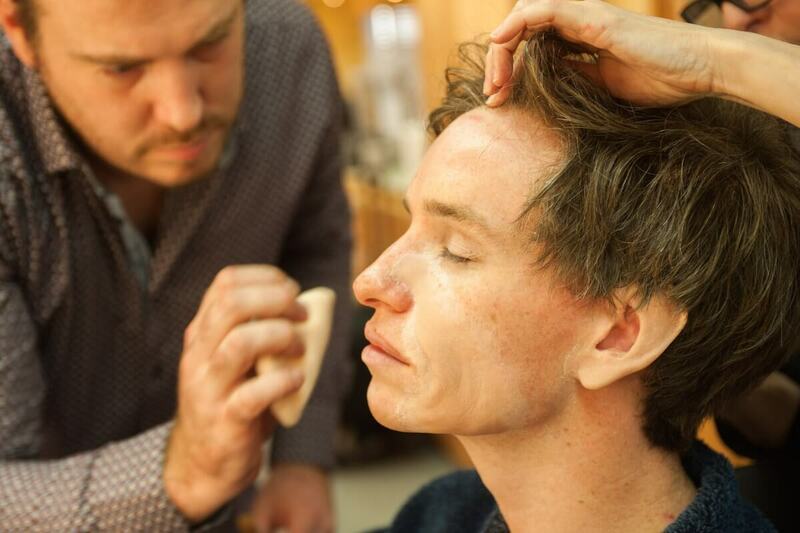 It might be for a rehearsal before makeup. It might be fully made-up and dressed, ready to shoot. The qualifier is that the performer is now working. Not getting coffee. Not sitting in the makeup chair. The time when the actor is out of makeup, out of wardrobe, and cleared to go home. This is the true end of their work day. 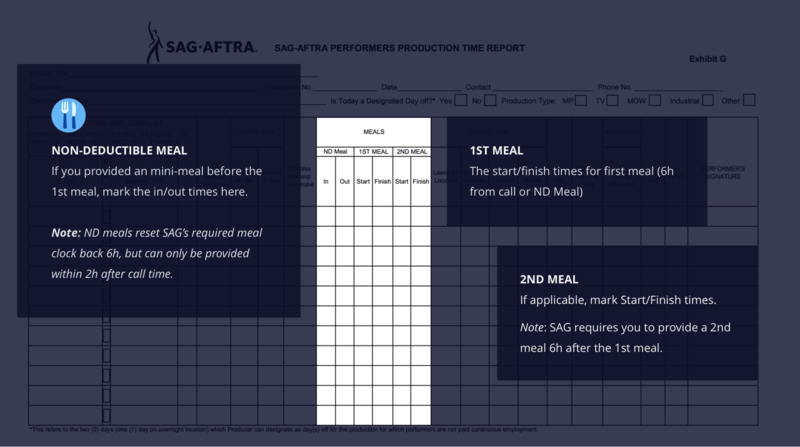 SAG-AFTRA has strict rules about the frequency and duration of meal breaks for actors. These breaks are tracked on the SAG Exhibit G.
This is where you record the start and end times of the Non-Deductible Meal on the SAG Exhibit G. Generally, you are required to feed your actors within six hours of their arrival. The non-deductible meal is a mini-meal break that you can offer to actors within the first two hours of their day. It resets the six-hour meal break clock, so their meal break can come six hours after the ND Meal. Here, you record the start and end times of the first meal of the day. If your production runs long, you must provide a 2nd meal within six hours of the first. If you have a 2nd meal, you record the start and end times here. If travel time is a factor in your production, this is the section where you record it. 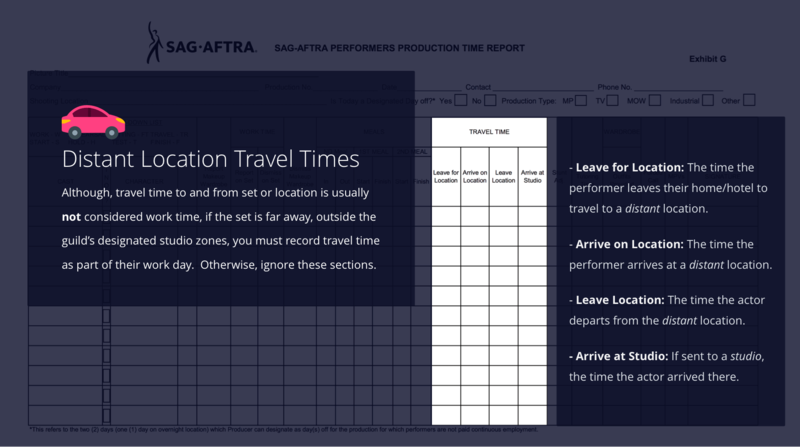 Although, travel time to and from set or location is usually not considered work time, if the set is far away, outside one of the guild’s designated studio zones, you must record travel time as part of their work day. In this event, the actor’s workday begins when they leave their hotel, not when they arrive on-set. This figures into meal times and overtime, too. Check with your SAG-AFTRA rep for specifics. Record the time the performer left their home or hotel to travel to a location outside the designated studio zones. If sent to a distant location, the time the performer arrived. The time the actor departs the distant location to go home. If sent to a studio, the time the actor arrived there. Make sure each performer signs the Exhibit G in the far right column before leaving set. Don’t worry -- They know the drill from the SAG Exhibit E form they sign at auditions. Scan the form, save it, and prepare a new, blank form for the next day of production. The finalized Exhibit G’s are due to the SAG-AFTRA offices on a weekly basis. This gives you time to fill in missing details and gather missing signatures. If you have any other questions or an unusual circumstance when filling out the Exhibit G, SAG reps can usually be contacted pretty easily. Lastly, scan and backup your SAG Exhibit G forms! Be sure to keep a copy of your Exhibit G forms to include in a wrap binder. You can scan your Exhibit-Gs on-set with your smartphone and a scanning app like ScanBot. Being a producer is all about finding efficiencies. Check out other time-saving producer tools or our recommended smartphone scanning apps. You can backup your SAG Exhibit G, along with your various production documents, securely in the cloud by using services like iCloud, Dropbox or a free film project management solution like StudioBinder. 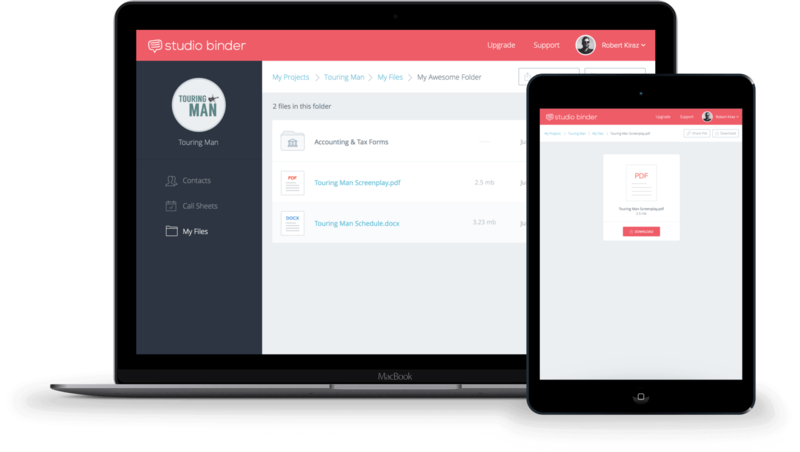 StudioBinder allows you to securely backup your production documents in the cloud, in addition to creating call sheets, shooting schedules and breakdowns. The Exhibit G may seem intimidating at first. But with repetition, it becomes second-nature. The information gathered for SAG’s Exhibit G can also be very useful for your own production. You may find the information you’re preparing for the Screen Actors Guild useful for your own production. Your production accountant may use the Exhibit G to calculate payments for the cast. Your production team might study the data to identify opportunities to improve production scheduling.